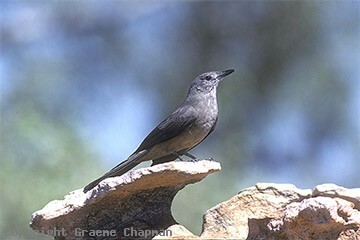 As their name suggests, Sandstone Shrike-thrushes range across much of far northern Australia in rugged sandstone country from Lawn Hill Gorge in far NW Queensland west to the upper Fitzroy River in the West Kimberley region of Western Australia. Their chosen habitat is mostly remote and difficult of access so little is known about their life history - they appear to be territorial and sedentary, living in simple pairs amongst the cliffs and gorges that make up their home. Fortunately there are a few well frequented tourist destinations for the more adventurous birdwatcher where they can be reliably found. At Lawn Hill Gorge, a walk up the gorge will usually be fruitful - their songs are quite loud and a good guide to their whereabouts. Likewise, at Merten's Creek and Surveyors Pool on Mitchell Plateau in the NW Kimberleys the camping areas are surrounded by suitable habitat. The superb Geike Gorge on the Fitzroy River in W.A. is another top spot. 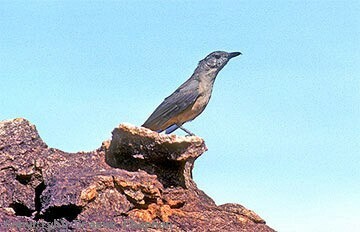 In Kakadu N.P. in the N.T. 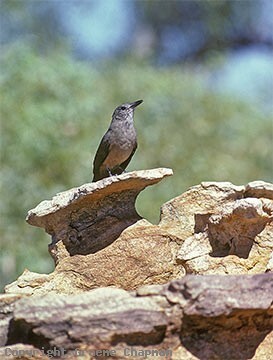 all along the edge of the Arnhem Land Plateau at the various access points is ideal habitat. For the less adventurous they occur at Hidden Valley on the outskirts of Kununurra. 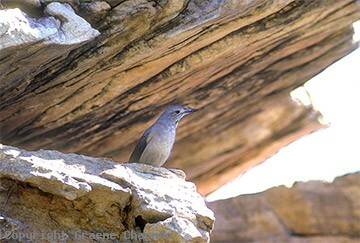 411201 ... Sandstone Shrike-thrush.Their superb song is often amplified by their rocky environment.